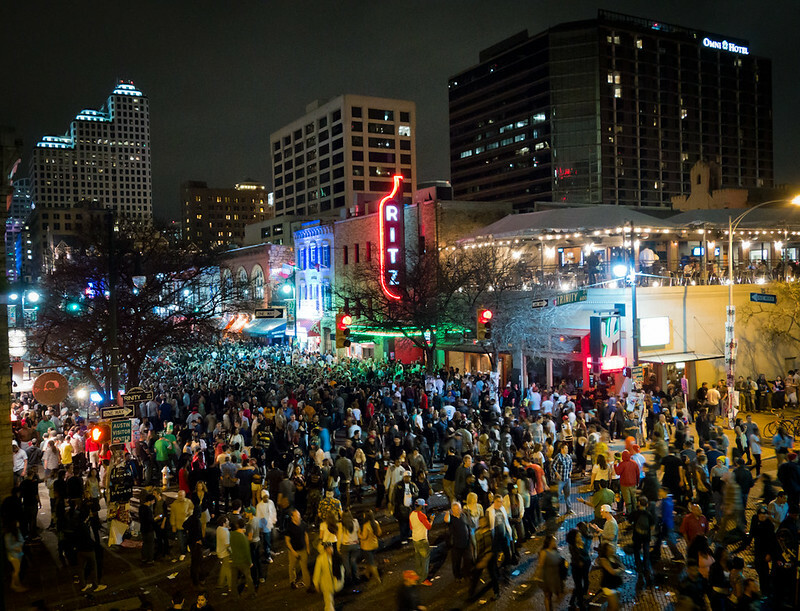 SXSW is a music lover's dream - like a kid let loose in a candy store. And although SXSW has been going on a week earlier, the music portion of SXSW began Tuesday (March 11th) and with over 2,000 acts representing over 50 countries at over 100 venues as far as the eye can see. It's a wasteland for music lovers, and for a week, Austin becomes the music center capital of the universe. I arrived at my hotel, overlooking downtown Austin, right before noon and went straight to the Austin convention center, basically the brain of SXSW, where I picked up my wristband and credentials. Excitement was in the air; that nervous energy of not knowing what to expect but still exciting of what the week holds in music. Gossling performs acoustic at the Liberty Tavern in the Hilton. Our first show was actually held at my hotel, the Liberty Tavern at The Hilton, where Australian crooner Gossling played an acoustic set in front of a packed audience. Gossling (aka: Helen Croome) proves that music doesn't have to be all flashy with tons of instruments and that all you need is a great voice to go along with greatly written simple melodies. Gossling's voice is the first thing that draw you to her; weathered and shiny to the point of showing rust - just like an aged wind chime gently blowing in the wind. It's peaceful and relaxing but also pierces soothingly through the air. 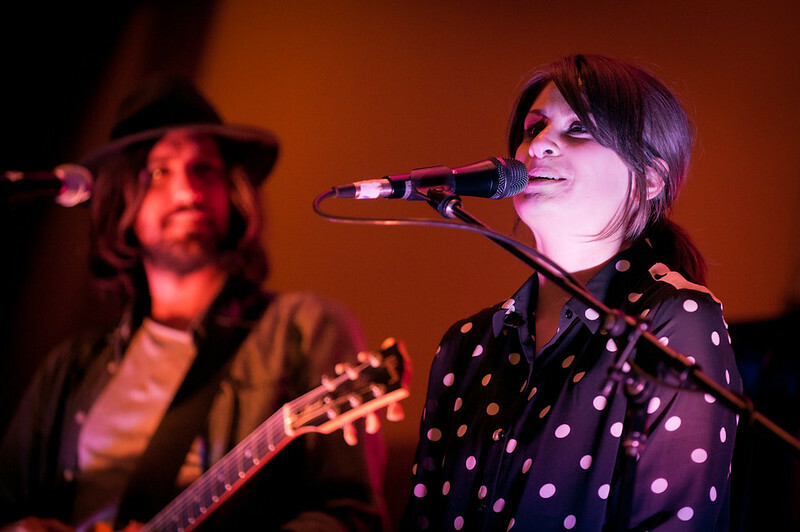 This best describes Gossling's music and even though she told the audience that she'd be performing later in the week with a full band, I couldn't imagine her songs any other way. 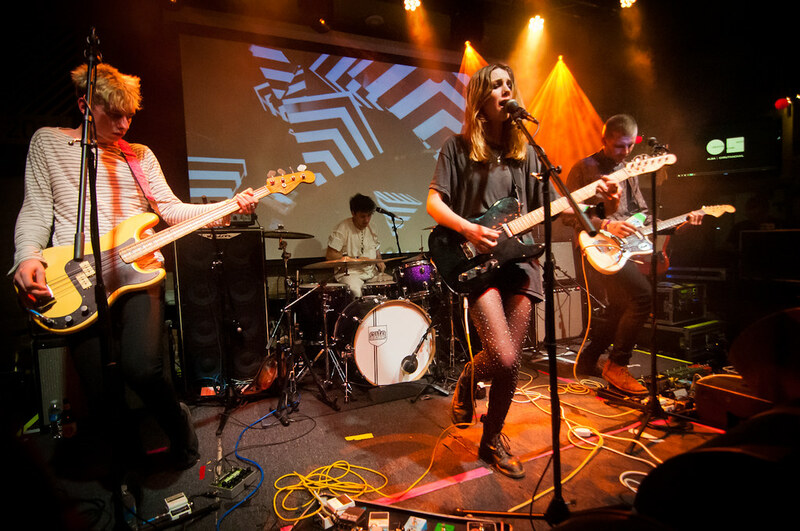 The British Music showcase featured Wolf Alice at Latitude 30. My next show on my schedule was at The Hype Hotel featuring The Colourist. Last year, The Hype Hotel was the place to be - showcases curated by influential music blogs who usually have a pulse on what bands will be big in the coming year. This year was no different. The line was long - even for badge and wristband holders. Unfortunately, the doors opened at 8pm and The Colourist went on stage at 8pm. By the time the line started moving, their set was nearly finished so I decided to skip the show and it was off to Latitude 30 which was hosting a showcase of British Music brought to us by BBC radio's Huw Stephens. 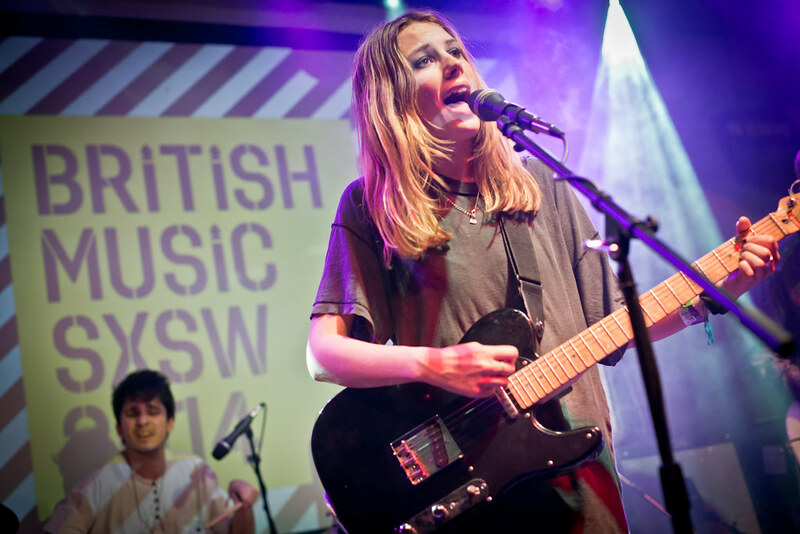 Wolf Alice performs their first U.S. show at Latitude 30 during SXSW. Wolf Alice was a band I kept reading about early on, even before SXSW began and just recently, it was announced that the group were confirmed to play this year's Reading and Leeds Festival. Led by front woman, Ellie Rowsell and consisting of Joel Amey, Joff Oddie and Theo Ellis, Wolf Alice reminds me of early 90s alternative, echoing the sugary sounds of Letters to Cleo, Belly with the moody, grungy melodies of Temple of the Dog. Their live set packed a punch. The venue, by this time, was filled to capacity and the large, opened windows allowed those who couldn't get in to watch and listen from the street. The Preatures makes classic rock sound brand new. The Haven is a great venue for shows. Unfortunately, this night's sound problems marred what should've been a great ending to a first night at SXSW. Featuring The Preatures and BANKS, a stream of boos filled the room each time the speakers went silent. Classic rock and roll is something you usually don't expect from Australia yet that's what The Preatures delivered to the packed crowd who crammed up to the front of the stage. Laced with a lot of attitude and armed with an arsenal of groovy and nostalgic tunes, The Preatures somehow makes classic rock sound brand new. Towards the end of their set, Isabella Manfredi, front woman of The Preatures, poured what was left in her water bottle on her head in hopes of cooling off from the stuffy and heated Haven floor just before launching into their hit single "Is This How You Feel?" 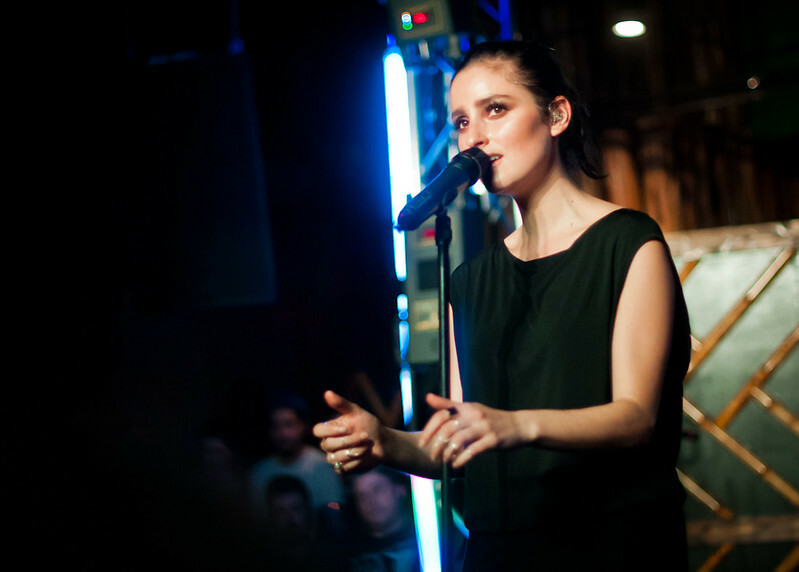 BANKS performs her very first music festival at SXSW. BANKS, the Los Angeles singer/songwriter, has been featured in as much fashion magazines than music magazines and it's not hard to see why. This beauty is more than a pretty face. Her style mirrors her musical stylings - dark and sleek. BANKS, in a recent interview with Elle, characterizes her music as hypnotic fusion. Her songs, do indeed, emote a sense of tranquility. But with a touch of soul and a soothing beat, BANKS music draws you in the night draws in the stars on a clear night. Even though BANKS' set had more sound problems as the night progressed, towards the end, the audience filled the silence by singing along with BANKS to close out the night.